of marijuana was found in her home. 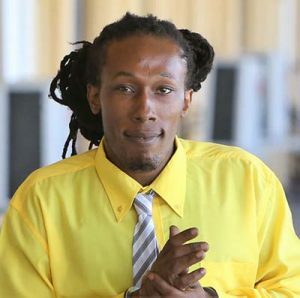 Police later learnt that the 27-year-old woman was planning on smuggling the contraband into the Camp Street prison for Mark Royden Williams called ‘Smallie’ who was recently handed the death sentence after being convicted on eight counts of murder over the February 17, 2008 Bartica massacre. It is suspected that they might have been planning a prison escape. 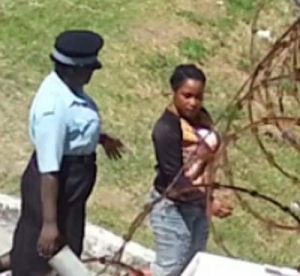 The woman, Kelly Ann Martin, a mother of two of 288 Ram Singh Street, Sophia, Greater Georgetown was arraigned before Magistrate Zamilla Ally-Seepaul at the Sparendaam Magistrates’ Courts. An unrepresented Martin denied the first charge which alleged that on February 16, at ‘B’ Field Sophia, she had a hand-held counter-strike (CS) smoke grenade in her possession, without being the holder of a licence. It was further alleged that on February 17, at the same location, she had 130 grams of cannabis sativa (marijuana) in her possession, for the purpose of trafficking. prison until March 27, for reports. The court heard from Police Prosecutor David Goodridge, that police ranks acting on information went to the home of the defendant and told her that they suspected she was hiding the illegal items in her abode. According to Prosecutor Goodridge, ranks conducted a search in Martin’s home and found the grenade and marijuana hidden in her bedroom. Prosecutor Goodridge related that in a caution statement, Martin admitted to police that she was taking the items for ‘Smallie’. The prosecutor disclosed that the defendant told police that she collected the grenade from an unknown person and intended to carry it to the penitentiary for the prisoner. The prosecutor further added that it appeared as though the parties were planning a prison escape. The court was told by the prosecutor that investigations into the matter are completed. However, the investigating rank interjected and stated that police are still waiting on phone records. Based on information, Martin was charged before for attempting to smuggle marijuana into the Camp Street prison. When this information came out in court, Martin denied it. But after much probing from the Magistrate, she eventually confessed that she was indicted before. That matter was however dismissed.